Versatile radiation controller for industry and science. Versatile industry measurement controller for control cabinet integration. Adjustable setpoints, relay output, condition visualisation via multicolour-LED, possible inputs – photo current 4 nA…4 µA, 4…20 mA, 0…20 mA, 0…x V (x configurable up to 10), DIN rail mounting. The RADIKON is used to control the value generated by a detector (e.g. radiation sensor or a pressure sensor). If the detector value falls below a certain setpoint value a relay is activated where a valve, an alarm buzzer or other modules can be connected. 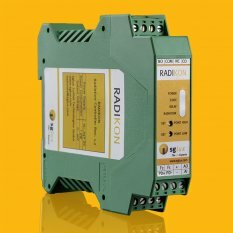 The highlight of the RADIKON is its high versatility making the module very interesting to industrial developers who need to match the controller with different input signals. The RADIKON can read the generic current of a photodiode (5 nA < ISensor < 5μA) as well as 0…x Volt and 0(4)….20 mA probe signals. The value x can be defined by the user. The RADIKON outputs a voltage of 0….10 V, which can be used to attach a separate display or to connect the RADIKON to a PID controller. A multicolour LED changes its colour with the radiation intensity level. All these features, as well as easy set-up and configuration, make the RADIKON a perfect tool for developers or manufacturers of small series. For medium series users controller modules are offered with customised properties..